Larry Martin, the winner of the 2018 Teachers Tournament, passed away on the morning of January 25, 2019 after a bout with cancer, The Shawnee Mission Post has reported. Larry won the hearts of many around North America with his excellent performance in winning the most recent Teachers Tournament; he had stepped back from teaching earlier this school year in order to focus on his health. The Jeopardy! Fan wishes to give its condolences to Larry’s family and friends. 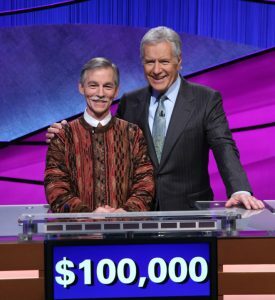 Larry Martin, shown here with Alex Trebek, won the 2018 Teachers Tournament. 19 Comments on "Larry Martin, 2018 Teachers Tournament Champion, Passes Away"
I didn’t know him personally, but in his appearances he was a true genrtleman. My condolences go to his family. So sorry to hear about Larry’s passing. 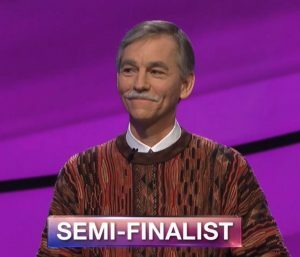 I loved watching him on Jeopardy. How sad! I so enjoyed watching him play. He seemed like such a compassionate, humble man who did our profession proud. Love and prayers for his family. So sorry. 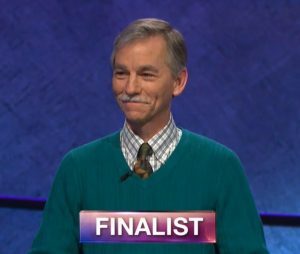 I really liked this man on Jeopardy. Such a class act. I never met him (although some friends and acquaintances of mine in the KC region did), but here’s to The Marvelous Mr. Martin! 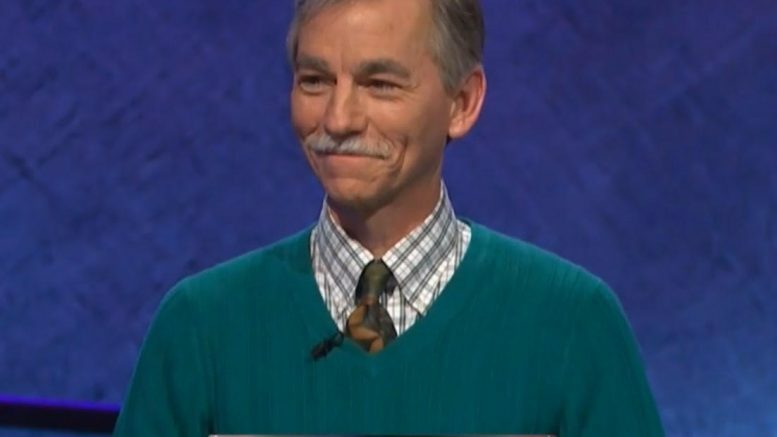 Truly a great Teacher, kind man, and great Jeopardy Champion! Rest In Peace, Larry! I got to speak to Larry a few times and he came across as nothing but a gentleman and truly passionate teacher. This is heartbreaking. He was great on the show. Sending prayers to him and his family. 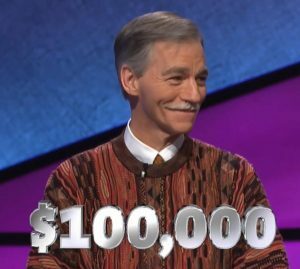 I never had the pleasure of meeting Larry, but I truly enjoyed watching him play Jeopardy. I cheered for him because I am predisposed to cheer for older players. I cheered for him because I am predisposed to cheer for career elementary teachers in Teachers Tournaments; elementary school teachers, I think, get too little respect. But mostly I cheered for him because he came across as knowledgeable and and gracious and really skilled at the game. May his rest be honorable. I met Larry and his wife on Jeopardy tournament as my daughter was also one of the participants in the tournament. I met him only once yet it was a very memorable moment. I cherished his compassion, humility and dedication to his profession. I feel very sad and feel that it is such a loss to the teaching profession as he would have contributed a lot more. I pray for him, wife and his loved ones. So sad. Seemed like a wonderful man. My best to his family, friends and students. May his memory be a blessing. This is really sad news. He seemed like a great guy. Condolences to his family and friends. My son was lucky to have Larry as his second-grade teacher. He loved being a “Martin’s Marvel”. What a terrific loss. He was wonderful. I am so sorry to hear of Larry Martin’s death. He was such a delightful and brilliant contestant. My deepest sympathies to his family. Seemed like a lovely person. God bless him.